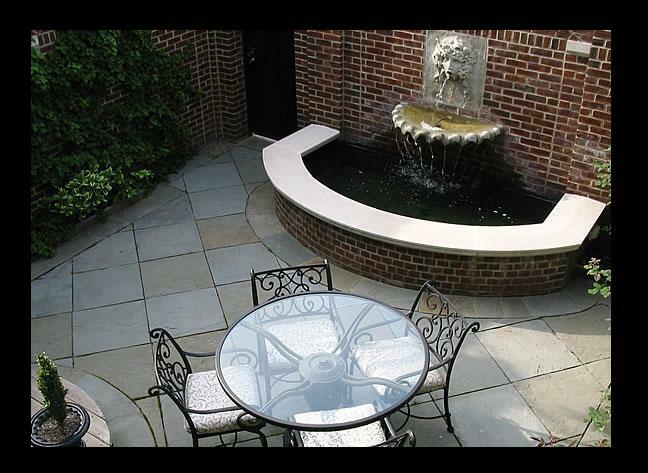 Many homeowners over the years have asked us to transform their outside spaces into cozy and intimate areas to gather with family and friends. It became more of a trend beginning in 2008 as the uncertain economy prompted folks to spend more time at home. 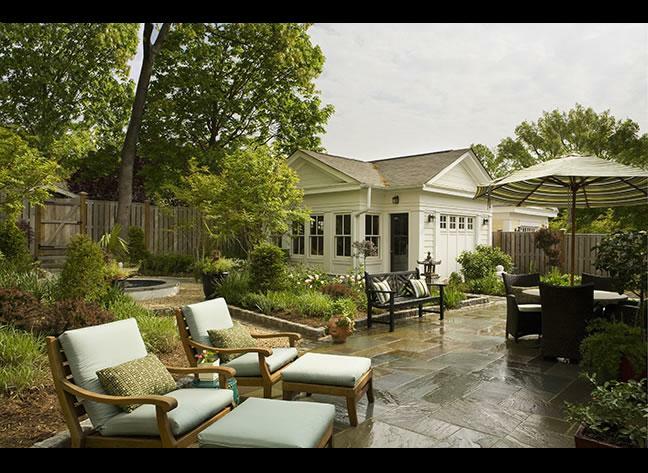 I call these small, safe, and intimate areas cocoon spaces and in addition to giving homeowners an inspiring new garden area to escape to with friends, these spaces can increase a home’s value by as much as 15%. The cocoon trend continues into 2011, but this year we’re turning up the heat! Because of recent technologies and new options from manufacturers, outdoor kitchens and fireplace/pits have become easier and much more affordable to install. 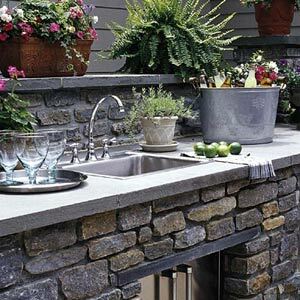 A small and thoughtfully designed outdoor kitchen area gives your home a new gathering spot, and an outdoor fireplace or fire pit adds a multi-seasonal cozy spot for intimate conversations with family & friends. And by using a mix of recycled stone and hardscape materials purchased from local artists and quarries, you can take a new “green” step in your garden space. It’s important to keep your trees and shrubs properly watered in extreme heat, especially if rain storms aren’t rolling through your area. Heat waves cause damage, so take the time now to give your trees and shrubs a healthy life for years to come. Birch trees and other trees native to cool areas will be the first to experience drought stress, so water them generously. And keep in mind, many drought-related tree problems may not show up until fall, and evergreen trees and shrubs won’t wilt to show they need water — so pay attention to all trees and shrubs in your landscape! Newly planted trees and shrubs need a couple of good soakings each week. It’s also important to water the area under your tree’s canopy. If you have an irrigation system, adjust a few heads to soak this area — you can also place a soaker hose through the lower branches of your tree. Keep in mind that trees and shrubs planted in the last few years will also require extra water, as will established trees. The quickest way to go? Get a glass of water for yourself, grab a hose for 20 minutes, and generously water your trees and shrubs a few times a week. Southern Living has a terrific video feature on making the most of your garden by moonlight. Editor Rebecca Reed shares her thoughts and ideas on the best plants and flowers to inspire you to make the most of the your gardens, garden paths and more during the evening hours. “Think Light Rather Than Bright” as not all colors stand out at night. By moonlight, reds and pinks look grey, and purples and blues just disappear. Be strategic, and keep in mind that plants with variegated foilage, such as variegated hosta, are big standouts by moonlight. I recently added LED lighting to my front, side and back garden spaces and these lighting additions have changed how we use our outside areas. As I’ve written in the past, you already own the space, so do all you can to make the most of it! Escape the Sun After the 4th! We’ve had several weeks in the DC-area where many of our days have exceeded 90 degree temps; this week we’re topping 100. This coming weekend it will continue to be warm and I’m sure I won’t be the only one seeking shelter from the sun. Below is a pic of one of the sun shelters from my garden, with the GardenWise studio in the background. Our fun brightly colored striped umbrella shields us from the bright sun by day and protects us from sudden rain storms by night. 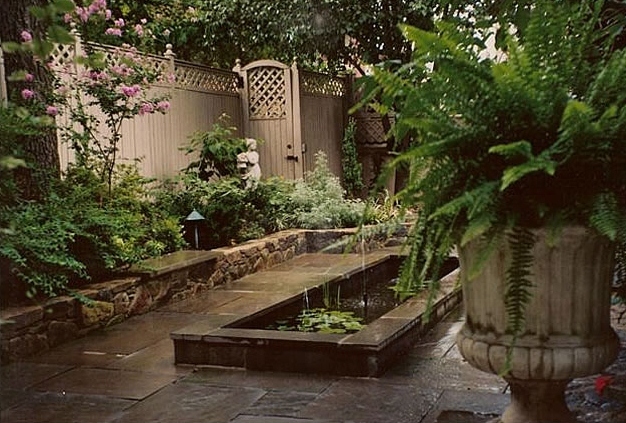 How do you escape the sun –what type of shelter do you have in your garden space? An umbrella, a covered pergola, strategically placed trees? Below is a post from Southern Living about Sun Shelters, a great link to share as we look ahead to another very sunny and warm summer weekend.